Witness to the Dark: My Daughter’s Troubled Times. A Comedy of Emotions. A book, unfortunately, many should read. I’ve started making the rounds to give final copies of my book to some of my early readers. One went to Reverend Rich Simpson yesterday. He’s the Rector at St. Francis Episcopal Church in town. I’m humbled by his blog posting. The Amazon.com Look Inside feature is now operational for my book, Witness to the Dark: My Daughter’s Troubled Times. A Comedy of Emotions. .
My book, Witness to the Dark: My Daughter’s Troubled Times. A Comedy of Emotions. , is now for sale. It’s available from Amazon.com or CreateSpace. A Kindle version is in the works. In a week or two it will be available for special order at your local bookstore. The second review is in for my book, Witness to the Dark: My Daughter’s Troubled Times. A Comedy of Emotions. . I’m pleased. I’ve excerpted it here. My Daughter’s Troubled Times. A Comedy of Emotions. 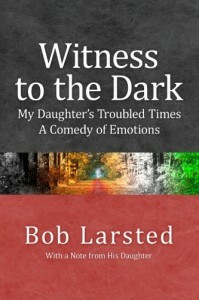 In this accessible, chatty memoir about his daughter’s struggles with mental illness, first-time writer Larsted narrates, in exhaustive detail, his rocky four-year journey navigating the perilous mental-health system, his daughter’s shape-shifting symptoms, intermittent hospital stays and behavioral therapy. A heartfelt, valuable resource and source of comfort for parents of mentally ill children. The first review is in for my book, Witness to the Dark: My Daughter’s Troubled Times. A Comedy of Emotions. I’m pleased. Bob Larsted isn’t the type of person who works out his problems in public. He had always made a point of “avoiding speaking in public—or to anyone for that matter.” And yet, the introverted engineer has written a moving memoir about his quest to find answers for his daughter as she struggled with serious mental illness. Witness to the Dark tells the very human story of a father who is just trying to do the right thing, even when he has no idea what that thing might be. Larsted’s self-effacing humor sets the tone for a book that easily could have become drowned in drama. The situation is undeniably dire. Larsted’s daughter Patricia has attempted suicide several times. She hears voices and has friends nobody else can see. Patricia spends her teen years cycling through hospitals and treatment programs, none of which offers a permanent cure. And yet, Larsted never resorts to a “woe is me” lament. Instead, he opts for an engineer’s problem-solving orientation: “Here’s what I did. Here’s how it went. And here’s how I screwed it up time after time and how I kept trying anyway.” Not surprisingly, sometimes it worked for him. Larsted points fingers not just at his own frequent follies but also at the American mental health system that failed to provide consistent, competent treatment. Each chapter is headed with a simple illustration of Patricia’s ever-changing medication regimen—cut the round one in half, take two of the diamonds, and add one of the oblong—that calls vivid attention to the fact that her doctors are scrambling for a solution rather than planning a considered course of treatment. In all of this, Larsted is pretty much on his own. His wife, Kate, is recovering from a stroke, and his younger daughter, Beth, is busy being a normal teenager. Whatever role they played in Patricia’s treatment is minimized; Larsted chooses to leave them out of the narrative to honor their privacy, a move that may have been unnecessary given that “Bob Larsted” is itself a pen name, and all of the family names are invented as well. Poems and e-mails from Patricia, notes to and from doctors, and some spot-on analogies about handling emergencies round out Larsted’s tendency to make a lot of lists. There are lists of Patricia’s dreams, lists of medications, lists of the dreaded phone calls to therapists (and the inevitable failure of the therapists to call back). Larsted acknowledges his own compulsive tendencies, though, with self-deprecating comments and gentle humor. Parents will identify with Larsted’s tenacity in getting treatment for his troubled daughter, as well as the missteps he makes along the way. While he honestly recounts the enormous struggles he has faced, his story also offers hope that even the most ordinary parents can rise to the challenge and find help for their child. Troubled Times. A Comedy of Emotions. I’m waiting for a couple of independent reviews to come back. When they show up, I’ll add them to this description on the back cover and make the book available worldwide. Join author Bob Larsted on the roller coaster ride of his daughter’s battle with sadness, cutting, and suicide attempts; depression, bipolar, and schizoaffective disorders. Mix in a little OCD, a lot of anxiety, and share their journey through the minefield of school, family, and today’s healthcare system as he searches to understand her darkness and helps her find ways to survive – and thrive – with psychosis. The Kindle version is on the way. I finished the first draft of my book today. It’s been in the works for quite some time. It was only recently that we made it to an appropriate place to give it a hopeful ending. This means that I’m no longer a pseudonym, but a pen name.